Go from frozen finger food to fresh. Taste and feel the healthy difference. Try our family approved cod recipes and see for yourself! Do you want great tasting cod recipes? I'm sure you must be aware of what cod fish is, right?... whether you realize it or not. The fish sticks found in the frozen food section of your local grocery store is often made with cod fish. Most likely, those battered fish sticks and fillets are made from minced fish, and often cod fish is used as the main ingredient. Those frozen fish sticks might taste decent enough, especially with a little tarter sauce and lemon squeeze. And they are quite simple enough to cook in order to throw together a meal real quick with a couple of sides for the family. That's cool and all, but fresh cod is much healthier, and can be cooked and served to perfection in about the same timely manner as that processed junk. 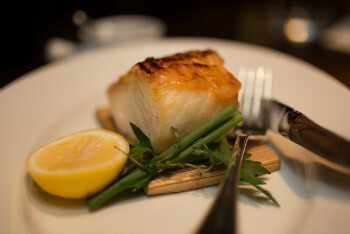 Anyways, here are some tasty fresh cod fish recipes that will put a really nice twist on your taste buds. Place the cod fish fillets in a baking dish or in a plastic zip loc bag with the lemon, ginger and dill marinade mixture for up to 15 minutes in the refrigerator. Place the pre-soaked grilling plank on a charcoal or gas barbecue grill over medium heat. When the plank begins smoking, place the fillets on the plank. Cover the lid and allow it to cook for about 10 minutes. When the fish is done, remove immediately and plate them up with a sprinkle of dill. Serve and enjoy. See how to prepare the Lemon Pepper with Ginger and Dill marinade. Pre-heat your grill or pan to medium heat. Lightly drizzle olive oil to evenly coat the cod fish fillets. Season the fillets with salt and fresh ground black pepper. 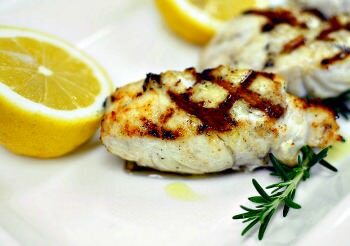 Squeeze lemon juice onto the fillets and sprinkle with the rosemary. Grill the cod fillets for about 4 minutes on each side until they're done when the fish flakes with a fork. Garnish with fresh rosemary sprig and grilled lemon wedges, serve and enjoy. Check out this baked cod fish recipe with dill, green onion, and soy sauce.